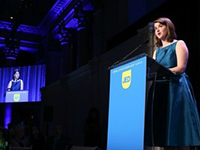 Maggie Skoch receiving an award at The Jed Foundation’s annual gala in New York. Maggie Skoch, a 2016 graduate of the University of Notre Dame, was recognized as this year’s Jerry Greenspan Student Voice of Mental Health Award recipient at The Jed Foundation’s annual gala in New York City on June 7. The prestigious annual award honors a student who has reduced prejudice around mental illness, raised awareness of mental health issues on campus, and encouraged help-seeking among their peers. Skoch, an Arts and Letters pre-health and theology graduate from Mentor, Ohio, will attend the Stritch School of Medicine at Loyola University in Chicago to pursue a career in psychiatry. Motivated by her own experiences, Skoch has been a prominent advocate for mental health awareness and education in the University community. She served as president of Notre Dame’s chapter of the National Alliance on Mental Illness, where she was an integral planner of the University’s Mental Illness Awareness Week, a series of events that educated students about the impact and pervasiveness of mental illness, as well as raised awareness of the resources available on campus. The week reached thousands of people both at Notre Dame and in the South Bend community, and won the award for Outstanding Club Event/Program of the Year in the 2014-15 academic year. Skoch also created opportunities for her peers to have monthly conversations about mental health through the “Espresso Your Mind” program, and has served as a member of the University’s Healthy Campus Coalition. In addition to her involvement with NAMI-ND and other campus organizations, Skoch also served as an intern for William Stackman, associate vice president for student services in the Division of Student Affairs beginning in the summer of 2015. This newly created role provided her with the opportunity to work collaboratively with Stackman, the directors of various Health and Wellness departments, faculty, staff, and students to promote mental well-being at Notre Dame and to examine best practices surrounding the withdrawal and readmission process for students. Skoch was also awarded the 2016 Rev. A. Leonard Collins, C.S.C., Award, honoring a graduating senior who has made substantial personal efforts to advance the interests of students at Notre Dame. The Jerry Greenspan Student Voice of Mental Health Award was established in 2008 through a contribution made by Carol Ullman and the late Joseph Greenspan, in memory of their son, Jerry Greenspan. The award includes a scholarship and recognition by Jed. Notre Dame is a member of Jed’s hallmark Jed Campus Program, a nationwide initiative designed to empower schools with a framework and customized support to enhance student mental health and improve substance abuse and suicide prevention efforts on campus.